This is so simple, you are going to love it. 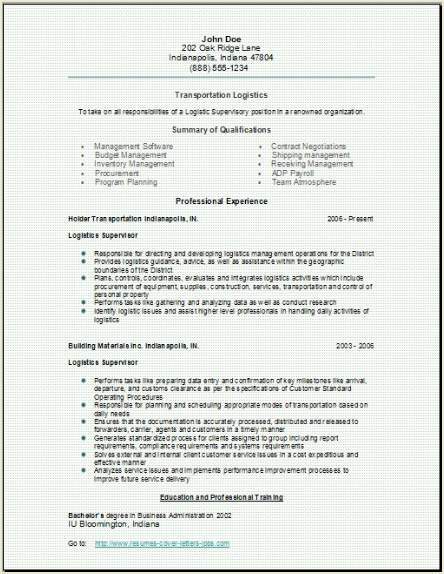 This page will help our visitor create a great looking transportation resume in just minutes. Go ahead and get your information from your previous job history in front of you. You will need this before you start. Just replace our example information with your own. 1. Enter your name--your address-- and your contact information. 2. Then enter your own objective. 3. Enter your resume skills by summary. 4. Now enter your past jobsite experience. Listing companies that you worked at, also list dates of your employment. 5. Last list all education. Don't wait till later to get this completed. Just do it today. This page helps our visitors with all the features you will need to add to your resume. These samples give you a great idea of the look you can achieve yourself. Besides, doing this yourself will not only be more rewarding, the plus side is your imagination is going to determine the final draft. Please return later the easy way, by adding our website today. 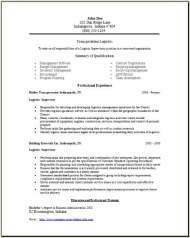 3 transportation logistics resume formats are above. 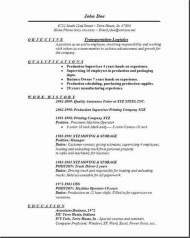 This resume will look great when you are done. Our examples are easy to use and you should be done within only minutes.Take your time and experiment. You can make it really nice by exploring the other samples on our website. You can also use this template! If you want to add your own photo for a personal touch, then try it so you can compare the look of all three when you are finished. Just make your editing professional looking and keep it simple works best. They will be concentrating on your experience section most of all, so do make it stand out profoundly. This position manages and directs the development of all material for the Receiving Department and is responsible for inbound material from overseas & domestic sales. This position manages the external relationships between this company and all of its in and inbound carriers, including rail shipments. 1. Ensure that the receiving personnel have the knowledge, training and resources to perform their daily activities. 2. Ensure that the receiving department has all of the EDI information the ASN notifications for incoming material. 3. Ensure that the managing logistics company for the rail road is performing to the contract specifications they have agreed to. 4. Manages relationships between the Receiving and Sales Departments to ensure that shipments are procured in a timely manner. 5. Negotiates freight rates for rail shipments. 6. Ensure that all of the rail rates are negotiated with the railroad. 7. Interact and coordinate with Production Schedulers to ensure the proper material is available for the production lines. 8. Monitor daily summary reports for shipments and inventory position from ILC. 9. Recommends and develops plans to increase the dept’s efficiency and productivity.